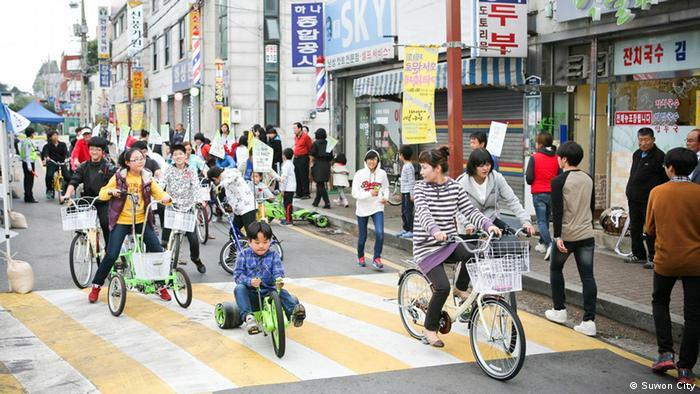 Residents in the South Korean city of Suwon have just spent a month without cars. Organizers and participants say the project could be a model for city life in the future. Local resident Lee Seung-ryong is riding a Segway around Haenggun Plaza in Suwon. He’s currently working as a volunteer at the EcoMobility World Festival, which has been underway in his neighborhood this month. A joint initiative between the Germany-based International Council for Local Environmental Initiatives (ICLEI) and the city of Suwon, the EcoMobility World Festival is forcing residents here to go car-free for a month. It’s a project aimed to show the world that you don’t really need a car to survive in a city. For the month, locals were asked to park their cars in a lot outside the festival perimeter. But the neighborhood’s 4,300 residents weren’t left entirely stranded. 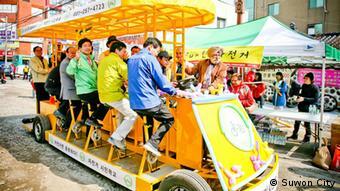 ICLEI provided them with various types of bicycles and other foot-powered means of transport. The idea of a car-free month came ICLEI head Konrad Otto-Zimmermann. He says few urban leaders envision the needs of a city 50 years into the future, which includes reducing its carbon footprint. Otto-Zimmermann says over two years he suggested the idea to mayors from all over the world. In the end, Suwon was the only taker. “In Europe some cities are very advanced in sustainable transport policies, so maybe they don’t think they need such an exercise in order to advance,” Otto-Zimmermann added. The suburb of Suwon where the event took place, Haenggun-dong, has definitely seen better days. Before it was chosen as the festival site, it was run down, roads were unpaved and littered with potholes, cars were parked everywhere. The whole neighborhood has since had a facelift. The streets are now even and paved with slate stones. “The residents of the neighborhood depend on their cars and business owners depend on customers arriving by car. 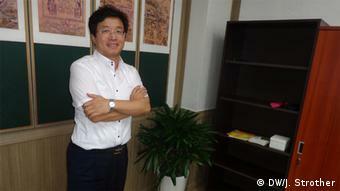 We really had to negotiate with them,” explains Suwon’s Mayor Yeom Tae-young. He says the promise of community revitalization won over locals who at first strongly opposed the festival. Many locals had protested outside of Suwon’s City Hall about the plan to go car-free, some even laid down in the construction site to block the redevelopment. But shop owners in the area implied the festival hasn’t hurt profits. “At first I was worried about my business, but after the renovations here, more people have been coming here and the neighborhood has become more vibrant,” says restaurant owner Hwang Hyun-ho. “Without cars, life is really more convenient now, there’s less noise and dust or illegal parking,” says Go Chang-ryong, who says he prefers foot traffic at his café anyway. Mayor Yeom Tae-young says he’s not sure if other cities can, or should, replicate the car-free experiment. But, he adds, for other natural resource-scarce countries like South Korea, reducing imports of fossil fuels in the future is an environmental and economic necessity – and reducing dependency on cars is one way to accomplish that. Mayor Yeom says he’s not ready to call the event a success just yet. That will depend on whether residents go back to their old, car-driving ways once it’s all over. Still he doesn’t regret the efforts he has made.